GALA Yuzawa Snow Resort is one of the best places to enjoy snow and winter sports in Japan! It can be easily accessed from Tokyo in one hour and a half by bullet train. The best way to travel to GALA is by using the convenient JR TOKYO Wide Pass. The JR TOKYO Wide Pass is a very convenient ticket that allows unlimited rides on all the JR lines in the designated area around Tokyo for three days for only 10,000 yen. Using the JR TOKYO Wide Pass, you can travel as far as GALA Yuzawa, one of the best ski resorts in Japan, located in Niigata prefecture. GALA Yuzawa can be reached by shinkansen (bullet train) in as little as 75 minutes from Tokyo. A one-way ride costs 7090 yen, which means that you would spend 14,180 yen for the roundtrip. However, by using the JR TOKYO Wide Pass, you get to spend less than 3500 yen on the transportation in one day! That's because the ticket priced at 10,000 yen is valid for three whole days in the designated area. After one day at GALA Yuzawa, you can use the same ticket to explore other areas around Tokyo - again, for less than 3500 yen a day. Let us introduce to you a day trip plan for GALA Yuzawa, one of the best places to enjoy snow and winter sports in Japan. The JR TOKYO Wide Pass can be purchased at the JR East Travel Service Centers located within major train stations in the capital such as Tokyo Station, Shinjuku Station, Narita Airport or Haneda Airport. The JR East Travel Service Center at Tokyo Station is located right by the Marunouchi North Exit. Upon acquiring the TOKYO Wide Pass, you will be asked to show your passport. This ticket can be purchased by visitors to Japan, as well as by long-term non-Japanese residents as long as they hold a valid foreign passport. In addition to English information about the pass, you will also receive a pamphlet with a map of the areas where it can be used. The JR TOKYO Wide Pass is nominal and valid for three consecutive days from the time of purchase. This means that you can explore three different areas around Tokyo for only 10,000 yen! As it is different from regular tickets, the JR TOKYO Wide Pass shouldn't be inserted into the ticket gates. You need to show it instead to the JR staff at each station. At 9:40, you'll already be in GALA Yuzawa. The train station is directly connected to the reception area - the Ski Center Cowabunga. Make sure to stop here first and receive information on the snow wear and sports gear rental services, on recommended ski and snowboard routes for your level of expertise, as well as on discount rental plans or events that may be taking place during your stay. All the concierges speak excellent English and will help you plan your day so that you make the most out of your time in GALA Yuzawa. Renting a ski set (ski, ski boots and ski poles) or a snowboard set (snowboard and snowboard boots) costs 4900 yen/day. There are also many discounts available so please check the GALA Yuzawa wear rental price list for further information. After you're all set up, hop in a gondola and head to Cheers, the center located at the bottom of the ski slopes. The photo above shows the wonderful sight that awaits above - a swapping view of the snow covered mountains! If you love skiing or snowboarding, then you'll probably want to hit the slopes right away. Take the lift to the summit, search for the route of your choice and enjoy the snow! On the other hand, if you can't ski or snowboard, but still want to enjoy your time at GALA Yuzawa, how about signing up for a Kanjiki Snow Fun Tour (2000 yen/person)? During this one-hour long snow activity, you get to wear the traditional Japanese show shoes called kanjiki, which allow one to walk on the snow without sinking in. 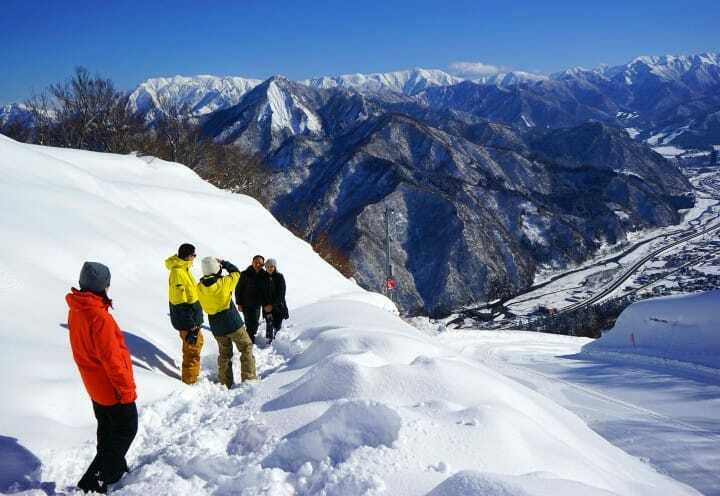 With your snowshoes on, you will go on a tour guided by a staff member of GALA Yuzawa. They will show you great photo spots around the area, help you build a snowman and teach you all kind of ways to play in the snow like sliding without a slay and diving. One of the amazing things we learned by taking the Kanjiki Snow Fun Tour was that the snow in GALA Yuzawa is different than the snow in Hokkaido or other areas. It is very soft and airy, making it ideal for winter sports. After two hours of playing in the snow, how about recharging with a tasty meal? With Cheers, there are several dining places such as the food court PALPAL which serves a wide array of dishes that can satisfy any taste, or the restaurant Seranbi Yama-no-Yuta which is specialized in local cuisine. Because we wanted to taste local dishes, we took this Tonkatsu set meal (1400 yen) made with Niigata pork. The set includes a delicious hot miso soup and is quite filling, giving you the stamina for another half a day of fun in the snow. For light meals, delicious ice cream varieties and tapioca drinks, make sure to check out the GALA Yuzawa store of the popular Okinawa ice cream shop Blue Seal, which is located on the mezzanine floor of Cheers. After lunch, how about taking the lift up to the summit and stop by the Bell of Love Observation Deck? This brand new observation deck is, first of all, a great viewpoint where you can see the whole surrounding area from. Enjoy the stunning views from above and have fun taking photos with the breathtakingly beautiful mountains in the background. You can either slide down or take the lift back. Either way, you'll have a great time enjoying the great views of the snow covered mountains. GALA Yuzawa boasts an international team of professional ski and snowboard instructors who hold lessons in Japanese and English. The lessons can be Beginner Level (5000 yen) or Novice Level (7000 yen) and last around one and a half hours. It is also possible to take beginner lessons with translation in Chinese and Thai. These are 2-hour lessons and cost 5500 yen. We took part in a beginner level snowboarding lesson in English. Our instructor, Curlain, started by explaining the basics about snowboarding and taught us how to set up our snowboard bindings. Next, we learned how to stop from sliding, a basic move that every snowboard beginner will want to master first. After several minutes of practice under the guidance of our instructor, by the end of the lesson, we were already sliding down the gentle slope in front of the rest house Cheers. If it's your dream to enjoy the excitement and freedom that only winter sports can give, then do sign up for a ski or snowboard lesson in English at GALA Yuzawa! After enjoying the slopes on the mountain, you can have a break back at the Ski Center Cowabunga. At Cafe Milano, they offer hot coffee, tea and snacks. On the second floor of the facility, you can also enjoy the cozy atmosphere of Cafe Irori, a place inspired by the traditional Japanese fireplace called "irori", a place that used to be the center of Japanese homes in the past. Also here on the second floor, there is a cafe called Yuta where you can enjoy delicious onigiri (rice balls) and tea. To relax your muscles after a day of skiing or playing in the snow, we recommend stopping by the GALA Yuzawa Spa, where you can enjoy the blessings of a hot spring bath. This will help you cure your fatigue and recharge. On the first floor of Cowabunga there is Jour de GALA, a shop selling Niigata souvenirs and local products, as well as original goods from GALA Yuzawa. The shop also offers a great variety of snow wear and winter sports gear. If you enjoyed your day at GALA Yuzawa and would like to come again or mark the day when you learned to ski or snowboard, how about getting a quality winter sports gear item from here? The ski slopes close at 17:00 in the winter and at 16:00 in the spring. After enjoying a day at GALA Yuzawa, you can return to Tokyo by taking the 17:01 shinkansen. With the JR TOKYO Wide Pass, there is no need to buy a separate ticket. Just show your pass to the station staff and hop on the train. You'll be back in the city before 18:30. Have a Great Time in the Snow Kingdom of GALA Yuzawa! No matter if you're an experienced skier or come from a country where it never snows, at GALA Yuzawa you will most surely have a great time! They offer a wide array of activities that can be enjoyed by everyone. The JR TOKYO Wide Pass makes it so easy to travel from Tokyo to GALA Yuzawa conveniently, so do take advantage of this ticket and enjoy a day out playing with snow at GALA Yuzawa. Price Rental: Ski wear (ski, boots, poles) Adults 4900 yen, Children 2500 yen. Gondola roundtrip ticket - from 1300 yen.